You know those teeny tiny beads inside your facial cleanser, body wash, toothpaste, and exfoliators?The ones that make you feel extra clean? Polyethylene Microbeads make YOU feel extra clean, but they're making our waters the farthest from clean. As you may know, they're used in many cosmetic products as an exfoliating agent. What you probably don't know, is that those little beads are actually made of plastic. Plastic is not biodegradable, and the beads are so small that they slip right through the sewage filter process. There are more than 300,000 microbeads in a typical bottle of facial scrub, and now 20% of our waterways are made up of these plastic particles. Hmph. Recently, LUSH Cosmetics launched their Ban The Bead campaign to urge the federal government to put an end to the manufacture and sale of Polyethylene Microbeads. "It's an ever-growing problem, but thankfully, the solution is in your hands. Choose products that only use natural exfoliants like ground nuts and shells, sea salt, polenta, beans and more to give your skin a good scrub without polluting our waterways", via LUSH Canada. 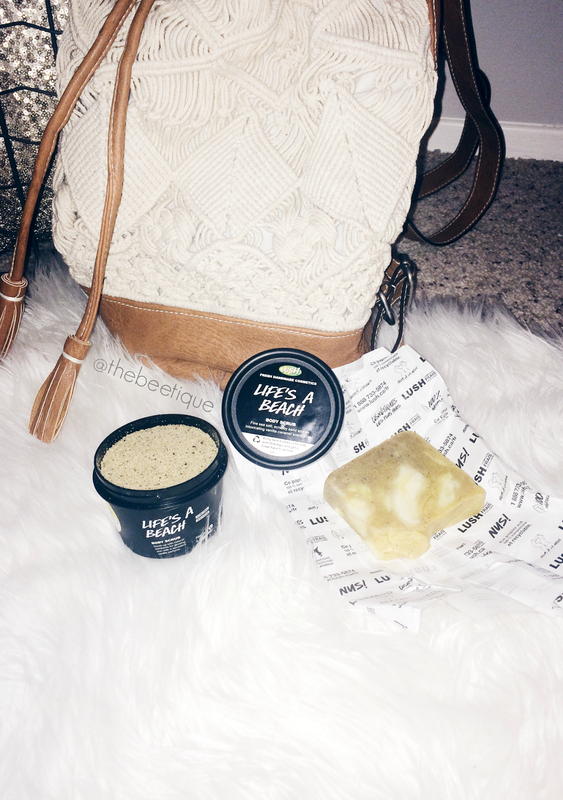 Life's a Beach // body scrub: "The Life's A Beach body scrub is formulated with sand and sea salt, and has a warm vanilla-caramel scent. It was born out of the brand's desire to help end the use of microbeads, but still allow body-scrub lovers to get the safe exfoliation they crave. In fact, 100% of the sale price will be donated to grassroots organizations that are working to eliminate microplastic pollution. Couple that with the fact that this scrub is just so ridiculously clever, and you've got a recipe for a fly-off-the-shelves product", via Refinery29. My review: I'm not big on exfoliating, but I totally respected the fact that 100% of sales would be donated to grassroots organizations. I found it pretty strange that the little 3.3 oz. pot contained completely loose sand (not the wet sand at the beach that tends to stick together), so it took me awhile to actually start using. One of the sales associates did a demo on my arm and it was crazy how smooth Life's a Beach had left that area - and the vanilla scent lingered for hours. This product does not lather, so to avoid using excess product I have been scooping a three-finger-tips amount and adding it to my body wash. The best part about Life's a Beach is that it cleared up the little red bumps on the back of my arms, a.k.a Keratosis Pilaris, just as effectively as LUSH's Buffy Body Butter. Now I don't have to worry about Buffy running out so fast! I purchased Life's a Beach for only $6.95. It sold out super fast and is no longer available online, but I can see LUSH bringing it back for good. Until then, I'll be using sparingly! Sandstone // Soap: "Sandstone is seriously scrubby; it’s the strongest, scrubbiest soap we make. Loved by men and women alike, it was inspired by babes on the beaches of Brazil who mix sand with tanning oil to make their backsides smooth as silk. The layer of sand will exfoliate your body as you wash to leave you with soft, touchable skin. For once, getting sand all over your bits is a good thing! Coriander and gardenia oils tone and brighten, and your skin will be seductively scented with citrus notes of a tropical cocktail. Have yourself a shower vacation! ", via LushUSA.com. My review: LOVE. I can definitely do without the lemony scent (reminds me too much of cleaning product!) but the way Sandstone instantly makes your skin feel is indescribable. After applying super gently, my skin feels tight - but not an overly dry tight, more like I-just-got-a-lift tight. I often mistake that feeling for a sticky residue that Sandstone leaves behind, but the lather makes up for it. No wonder Sandstone was inspired by Brazilian babes who used sand on their backsides! My only advice when using these two amazing products is firstly to always remember that you're working with sand. Sand is awfully rough - so be gentle and do not overuse! Second, be prepared for the sandy mess at the bottom of your bathtub or shower. Although that'll be annoying at times, it's 430,000 times better than cleansing with Polyethylene Microbeads.... and I say 430,000 because that's how many plastic microbeads exist in one square kilometer of Lake Erie. GROSS! 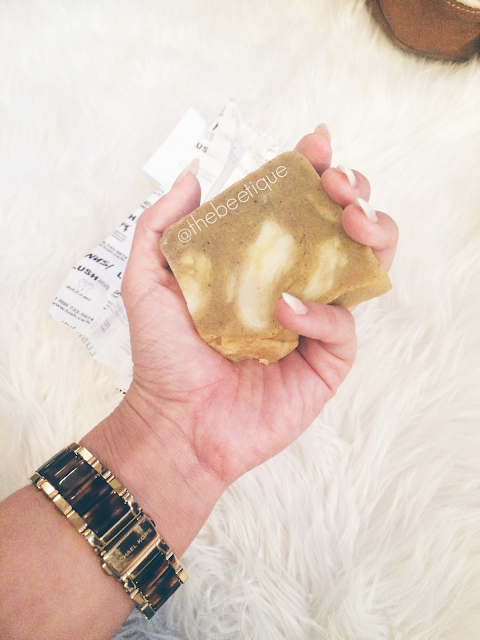 Love Lush Cosmetics?! Same boo! Check out my other reviews here. 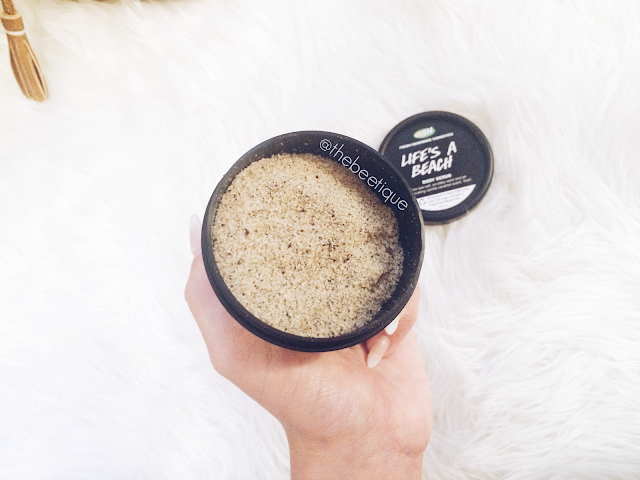 2 comments on "LUSH » Life's a Beach & Sandstone Review"
Thank you for your kind words! Glad you found my review informative.